This is my mother-in-law's recipe, and could also be called Apple Crisp. The original recipe calls for an egg, but I like it better without. Grease a 9 x 13 pan and put sliced apples on the bottom. Pour over apples and bake about 45 minutes until browned and apples are soft. Delicious!! You could top with whipped cream or ice cream, but we ate it plain and it was just fine. In these golden latter August days, Nature has come to a serene equilibrium. Having flowered and fruited, she is enjoying herself. I can see how things are going: it is a down-hill business after this, but for the time being, it is like swinging in a hammock, - such a delicious air, such a graceful repose! I'm not the God, I don't think. In our household, "not the God" has become the phrase of highest praise, and we use it sparingly. 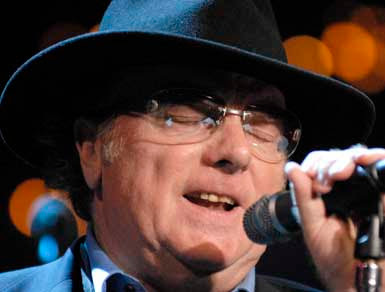 The man about whom we say it most often is Van Morrison, who is 62 years old today. If I had to choose just one musician to listen to throughout eternity, it would be Van. I believe someday, long, long after I have departed this earth, he will be taught in colleges along with Yeats and all the other great poets who have ever lived. His work encompasses all human emotion from the depths of melancholy to the heights of ecstasy. He writes love songs and loss songs and spiritual songs and nostalgic songs. Though I own a lot of his albums, there are still some I need to complete my collection. Some people point to one or another as "the best." Some people speak of certain periods of his writing as "the best." To me, it is all of a piece. It is his "oeuvre." One album flows into another, one year flows into another. I am a fan, not a scholar, but I could happily ensconce myself in a wood-paneled study for the rest of my life and "study" Van's work. There is so much there, so much symbolism, so much passion, so much of both the material and the spiritual world, that one could listen forever and never know it all. Just like Shakespeare or Yeats or Keats or Donne. He's in good company. And he is worthy. The song playing is Star of the County Down from an album done with The Chieftains. I'm going to start taking Thursdays off from the computer. I'm not even going to turn it on. No looking things up, no emails, no reading of blogs or writing my own, no ordering. A totally disconnected day each week. I'm interested to see how this will feel. I love my computer. I love connecting with people and learning new things. I love reading about books and music. But too often I get "caught." I plan to do one thing that will take five minutes, but end up here an hour later. :<) You all know how that goes. So, I'll see you on Friday. Today my mother would have been 94. An impossible age for me to imagine. She died at 59. 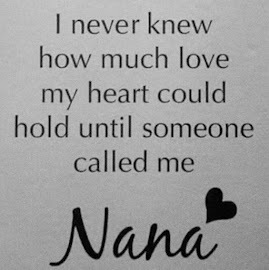 I think of all the birthdays she has missed. I think of all that these 34 years have brought. Her daughter's marriage, two grandchildren now in their twenties, and in the wider world: Watergate, Nixon's resignation, the end of the Vietnam War, videos and dvds and cds and cell phones. Her last vote was cast for George McGovern. When she died, most of her brothers and sisters, as well as my dad's, were living. Now just one of her sisters is still alive. I think that had she lived, she would still be full of curiosity, she would still delight in young people, she'd be hoping for a Democratic win, she'd be baking bread, and playing solitaire, and probably watching Grey's Anatomy and Lost with such pleasure. We'd be exchanging book titles. My kids would spend tons of time with her. She'd be telling them stories of me when I was little, and about Tom and I when we first met, and what an advocate she was for long-haired hippies, and how important family is. She'd be going to communion at her Episcopal Church. She would delight in women ministers. This is her high school graduation picture when she was 16 (!!) years old. They started young in those days. By the time she was 20 she was a registered nurse. I wish she were around to tell me about the forties on the home front. And how she and my father met. Oh, I have a million unanswered questions and a sadness in my heart that never goes away. The great mystery writer, Robert B. Parker, has written a book for the younger crowd, called Edenville Owls. I haven't read much about it online, yet I can't help but feel that this book has a lot of his own childhood in it. The book begins just after World War II ends. We get little chapters about the radio shows and commercials of the day, but mostly it is a story about all of us at 13 or 14 years old. There is a mystery - who is the man involved with the new teacher? And there is basketball. These boys have formed their own team, sans coach, and are figuring it out as they go. I loved it. I love the spare language, I love the time period, I love the boys, and I love Joanie, whom, I am quite sure, is based on Parker's wife. The "hero" of the story is Bobby. 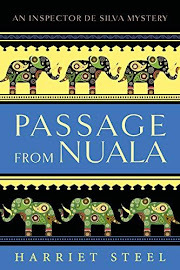 I'm hoping that the typical concerns of junior high boys will grab young readers, and they will come away from the book with a greater knowledge and understanding of those times so long ago to them. We learn a lot about the war and its effects on people, and we learn what life was like for women in 1946. I feel quite certain that this will grow into a series, and I hope it does. The visiting squirrels (and chipmunks) are quite young and unafraid. I can say no thank you to ice cream. I wouldn't waste money gambling. I can have one cocktail and know that is enough. I'm even pretty good at not buying plants. But books? How can I resist? 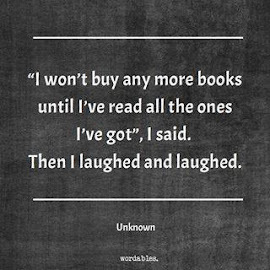 Recently, I've bought a few online and a few in the bricks-and-mortar bookstores. 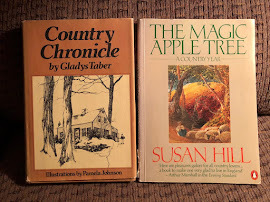 And because I love seeing everyone's purchases and bookshelves, I thought you might like to see the titles. My bookshelves are full. I had to place them on a shelf which had been used for something else. So, they have their own special place with my favorite bookends. They are right behind me as I sit at the computer. I want to say thank you very much for all your comments about MacIntosh. Each one was so warm and caring and heartfelt. Your sympathy and genuine concern consoled our sad hearts. Thank you. It calls for French bread, but I just use my own bread. Slice bread into thick slices. Beat the eggs in the electric mixer. Add the milk, vanilla, flour, and salt. Be sure all the flour is combined. Heat a large skillet (I use an electric fry pan). When the surface is hot, add a teaspoon of butter (I use cooking spray) and coat well. Dip the bread slices in the egg mixture and drop into the pan. Cook approximately 2-3 minutes each side or until golden brown. Repeat until all bread slices are cooked. Slice bread diagonally (or not) and dust with confectioners sugar. Serve with butter and maple syrup. I love this recipe. It is one I've used over and over again, and it is always great. I'm using the last of this summer's fresh blueberries to make a delicious dessert. This is my standby, and really my favorite of all the blueberry recipes I make. It couldn't be easier, and it is simply scrumptious. Grease a 9 x 13 pan and add 4 cups of blueberries. Shake the pan a bit to even them out. In a separate bowl, combine 1 cup sugar, 3/4 cup flour, and 3/4 cup oats. Melt 1/2 cup butter, and stir in. Drop mixture over the blueberries. Bake for about 45 minutes in a preheated 350º oven. You may serve it with a little whipped cream or vanilla ice cream or just plain. It makes a nice breakfast, too. This is the last photo I have of our dear Collie, MacIntosh. I thought I had all the time in the world to take pictures of him, since he was only seven. As you may have read when I featured him, he had epilepsy. The poor boy had it for five of his seven years. Before he went on medication, it was terrible. Sometimes he would have several seizures in a day. Then he would go a long time and have them again. There was no rhyme or reason. Once he began taking medicine, he had far fewer. But still they would happen occasionally. The medication came with a possible toll and we accepted that. We felt it was better for him to have a shorter life than a life filled with horrific seizures. But the vet told us that he didn't think he died of a side-effect. He wasn't sure what the problem was, but it was possibly a brain tumor. We could have done tests, but they may not have been conclusive, and it just didn't seem fair to him to have to go through them. He hadn't eaten in several days, but at first that didn't send up any alarms, because he quite often didn't want food. Sometimes he just wanted "people food." Sometimes, the meal he ate one day, he wouldn't touch the next. This is just the way he was and had been for ages. He drank tremendous quantities of water, and we had decided to have him tested for diabetes. Yet, thirst is a side effect of one of the drugs, so even that didn't concern us terribly. But in this last week, all his problems just seemed to combine to overwhelm his poor body. The day our vet came to do his annual farm visit, he was going to give MacIntosh his shots, but a hour before the visit, he disappeared. Even that he had done once in a great while, but this time he didn't come home. The vet thought he had perhaps gone off to die, as animals are known to do sometimes. We had an uneasy night, and my gosh, the next morning he was home. At first, we were elated, but as the day wore on, we saw that he wasn't going to get better. Instead of crawling off to die, he came home to do so. His breathing was labored and we could see various signs of decline. Our dear vet came by after his long day, and very gently put our boy down. In just ten months time, we have gone from a household with four dogs to two. Our Annie died last October. MacIntosh was the gentlest, most loving dog who gracefully put up with his medical problems, as all dogs do. They accept. Every dog's death is a great, great sadness, but it is especially hard when a dog is still young. We just thought he would have more years. 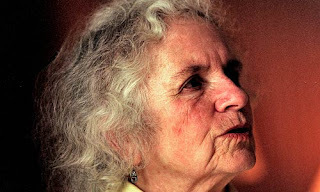 Grace Paley, the activist and writer whose vibrant, Bronx-accented short stories illuminated the daily trials and boisterous interior lives of working-class men and women in language that radiated humanity, intelligence and streetwise humor, has died. She was 84. 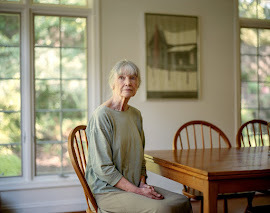 Paley died of breast cancer Wednesday at her home in Thetford Hill, Vt., said her husband, playwright Robert Nichols. Grace Paley was supposed to be at the poetry reading I attended this summer. She wasn't able to come, we were told, because of a family commitment. In honor of her, this poem was read. It is my favorite. One of the many joys of our "grand day out" yesterday was a visit to a shop owned by an African-born woman, who travels there a couple times a year and brings back wonderful art. We hadn't been shopping in this town for many years, but we walked in and were greeted as if by a family member. "Of course" she remembered us, she said. I bought this beautiful, beautiful, amazingly comfortable, hand-carved chair. She meets the people in Africa who create the work she sells and she told us that this was made from mahogany, in Guinea, by a "handsome, very black man, with two wives and many children." Isn't it just the best?! It comes in two pieces and you can see how even the back has lovely carving on it. My daughter bought a gorgeous bowl in shades of green and blue, and a three-tiered basket. The owner was so delighted to see us again that she gave my daughter her choice of two animal napkin rings, and me a banana leaf picture. Here are two views of how the chair fits into the living room. As you see, it is a very simple, rather "minimal" room. We rarely have more than two people visiting at a time so there are just enough places to sit. Last evening some friends dropped by, and I got to sit in the new chair, though each of them tried it out and pronounced it beautiful and very comfortable. 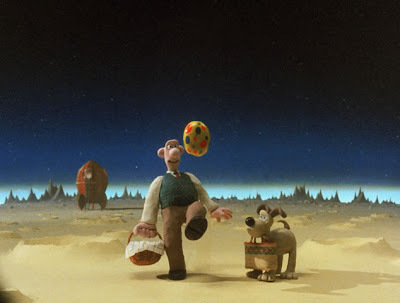 I had never heard the phrase "day out" until the Wallace & Gromit movie, A Grand Day Out. Well, today my daughter and I are going to have one. I don't know how long it has been since we went "clothes shopping" together, but we're going today! I am here to report that reading can change one's life! A few years ago, I read a Rex Stout story called Murder is Corny. In it, Nero Wolfe expounds on the "right" way to cook corn on the cob. 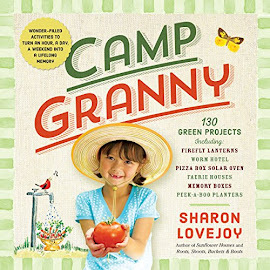 The episode is included in the wonderful cookbook. It developed that the delivery boy, who was taking some corn also to Rusterman's Restaurant, was attacked and killed behind the restaurant, and the unraveling of that murder is the story of Murder is Corny, during the course of which Wolfe explains to Inspector Cramer the best way to cook corn on the cob. Wolfe: It must be nearly mature, but not quite, and it must be picked not more than three hours before it reaches me. Do you eat sweet corn? Wolfe: No. Millions of American women, and some men, commit that outrage every summer day. They are turning a superb treat into mere provender. Shucked and boiled in water, sweet corn is edible and nutritious; roasted in husk in the hottest possible oven for forty minutes, shucked at the table, and buttered and salted, nothing else, it is ambrosia. No chef's ingenuity and imagination have ever created a finer dish. Before putting in the oven, pull off the loose husk leaves, and cut off the tassel. We have the oven at 425º F. They do cook about 40 minutes. 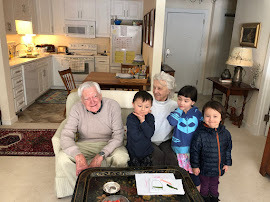 This morning I went over to visit Beverly at Tea Time and Roses, and she had left her readers a note to say that she was going to take a little break from blogging to spend time with her husband to relax and "take in the sights and sounds of summer." Isn't that just wonderful? Well, it reminded me of a quote I jotted down from a Penzeys catalogue. I read it each year about this time, and find it very meaningful. It is a bit like the Gladys Taber quote on my sidebar. 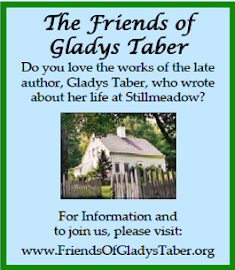 This recipe came from the late Susan Stanley's extraordinary Gladys Taber website. I have spent many hours there over the years. Reserve 1/4 cup flour and dredge 1 1/2 cups of the berries in it. Mix dry ingredients, combine liquids and add quickly to dry ingredients. Drop by spoonfuls into buttered muffin tins and bake twenty-five minutes in a hot oven, 450 deg.F. This makes twelve muffins, and is enough for three ordinary people, so it must be doubled for our brood. G.T. I used butter, as I always do, instead of shortening. Don't you love that word "dredge?" Here's a picture of the dredged blueberries. The touch of color is the reflection of the orange mixing bowl. I am over my end of summer melancholy, and looking forward to cooler, darker days. I woke up this morning to a chilly (53º F), rainy day, and Tom and I couldn't wait to get the woodstove started. Just yesterday, he and our son brought wood up to the terrace. This is the first fire we've had in a while, and I so love it. You can see the kitties are all set for the day, but Soot will have to move over so I can sit beside him and read Pardonable Lies. Remove from heat and stir in 2 cups sugar. Spread into a greased 15 x 10 pan, and bake for 20-25 minutes or until brownies begin to pull away from the sides of the pan. Do not over bake. I frosted them with the whipped cream mixture that I am so wild about this summer, but you could also use a confectioners sugar frosting. Combine sugar, cocoa, and cream. Chill in the fridge for at least an hour. Remove and whip until stiff. I use the blender, and it takes less than a minute. In our part of the world, today is the last time there will be fourteen hours of daylight until April 27, 2008. Cheery yellow daylilies on a raw, dreary day, each one just a bit different from the other.